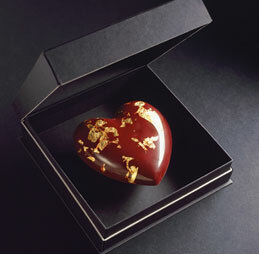 Ready to be paired; but to what wine would you betroth this chocolate heart by Pierre Marcolini? Large heart-shaped box decorated with burnished gold, filled with a selection of pralines. From the Pierre Marcolini Valentine 2005 Collection. Those who love fine chocolate and fine wine find key points of similarity. Both are made from fruit (the cocoa nibs from which chocolate is made are the seeds of the fruit of the cocoa tree, and fruit was eaten by early Americans long before they discovered how to make chocolate beverage from the seeds). The flavor and aroma yielded by both cacao pod and grape are a function of not only their rootstock, but of their soil, climate, and the weather conditions affecting any single harvest. Both are made from a blend of beans or grapes, each with distinct flavor profiles; and when the product is made from a blend, it adds to the complexity of tastes. Just take a look at the vocabulary professionals use to describe the flavors and aromas: You’ll find hundreds of words, a seemingly impossible number but truly authenticated. The good news for those who love them both is that wine and chocolate complement each other. What might sound at first like an unlikely marriage is quite a harmonious one—with a bit of pre-marital counseling. As with foods, there are many kinds of chocolate preparations with different flavor profiles; so no one wine is a universal match. While that creates a challenge to find the perfect suitor for a box of assorted bonbons; it also makes it fun to seek your favorite pairings, and test on an ongoing basis which combinations you prefer. In general, semisweet and bittersweet chocolates go best with stronger red wines while milk and white chocolates paired better with lighter reds and sweeter white wines. The perfect pairing balances sweetness, fruitiness, and acidity—and your own flavor preferences, of course. Most of the time, Champagne and chocolate don’t pair well. Against the sweetness of the chocolate, Champagne appears tart; even the secs and demi-secs (sweet Champagnes) are too delicate to stand up to the cocoa butter mouthfeel of chocolate. Save the Champagne for fresh strawberries. 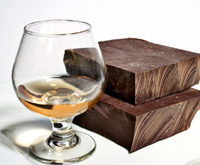 Similarly, Rieslings, Chenin Blancs, and Sauternes lack the right structure to pair with rich chocolate. They do, however, pair with white chocolate. One prominent sweet wine that does have the balance to pair splendidly is Muscat or Moscato. Another ideal pairing is fortified wine: Port or Banyuls, a red wine made of Grenache in the Languedoc Roussillon region of Southwest France. Save the complex vintage Port to savor with the cheese course or after-dinner drinks; and bring out the Ruby Port and Tawny Port to drink with chocolate. Some experts don’t believe in drinking dry red wines with chocolate. We disagree, as long as it is a wine with straightforward, strong notes—not too dry, too tannic, or too astringent. Try it and form your own opinions. The cocoa butter in the chocolate mellows out the tannins and astringency; and fine dark chocolate (semisweet and bittersweet) has enough complexity to hold its own with most reds. However, it isn’t as simple as the chart looks. As you’ll see in the next step—the chocolate and wine pairing chart—pairing individual chocolates with wine is as complex as pairing the right wine to the right dish. Change the sauce on the pasta from seafood to tomato, and you need a different wine. Change the center of the chocolate from mint to nuts, and you need a different wine! TheNibble.com’s recommended Chocolate And Wine Pairing Chart. Our guide to holding a chocolate and wine tasting party.